One great tip that I always say to people around me is the importance of “Idea Dump”. Idea Dump is basically throwing all of the things that’s bugging your mind either via pen and paper or through your digital app. Think of brainstorming. You undergo a process of just going through with all the thoughts and the solution for your problem. I love Idea Dumping. It is easy, effortless and it will really ease your mind. I most commonly brain dump for my blog especially when I badly needed new ideas for my next posts. I also do some idea dump when I go grocery shopping and also when I think of how my next month will be. If you want to be successful in your career then you ought to know the value of idea dumping. I know most don’t even realize the benefits dumping their ideas will be but if you are constantly feeling stressed and depressed in what you do then maybe this solution is what you’ve been waiting for. On the piece of paper write down the everything that is in your mind. You can go on a funnel mode here wherein you start with the bigger picture and goes as specific as possible towards the end. If new ideas come then make sure to write it down. I am a living testament of how constant idea dump will make you feel better. My current commitments has been mind blowing as I have my daily job, my weekend events and my everyday blogging to ponder about. What I love about idea dump is that I can instantly feel the effect as my thoughts feel light. 2. Motivates me to Take Action. Since most of my idea dumping are actionable items for bigger projects I want to release soon, Idea Dumping gave me inspiration to act. I try to really come up with action words for my items just to really destroy my possibility to procrastinate. 3. Make you memorize your thoughts. I happens to be most of the time that I have something in my mind at the moment and then since I haven’t written it, the idea will just vanish. That is why I love the notes section on phones because I can easily write what’s on my mind without worrying that I’ll miss something. I am also happy that the Notes section in the Iphone is currently synced in the Google Mail so whatever I write on the Notes of my Iphone I can just copy and paste via Gmail. 4. Lets you decide accordingly. If you are facing a dilemma or something that needs to be decided upon then do an idea dump on the pros and cons. I love doing that in order to strengthen the decision that I’ll be making. Do you remember the story of The Empty Cup?! Below is the whole story that I hope you will read. You’ll get the whole point of how Idea Dump actually works. Sometimes we need to empty our mind to be able to grasp new concepts and understandings and this could only be achieved via Idea Dump. 1. Decide on whether you will go with paper or paperless. There are those who doesn’t like writing things so you can always use an app to help you. Always bring a paper with you even with just a mini notebook or post its so that if anything pops up in your mind you are ready. 2. Do not rush. Spend a good 10-15 minutes of your morning or your night to do the Idea Dump. Rushing in the process can cause you to lose some valuable notes along the way. 3. Make it a habit. Of course part of my tip will be to incorporate “Idea Dump” in your routine. Make it a habit that you will look forward to. Remember that it will take 21 days for something to form as a habit. 4. Organize your Ideas. Once you dumped it you need to segregate the ideas depending on what’s most actionable. I actually put most of my idea as part of my Weekly Tasks or my Daily Tasks. There are some thoughts that are for future so I mostly use them as reference. 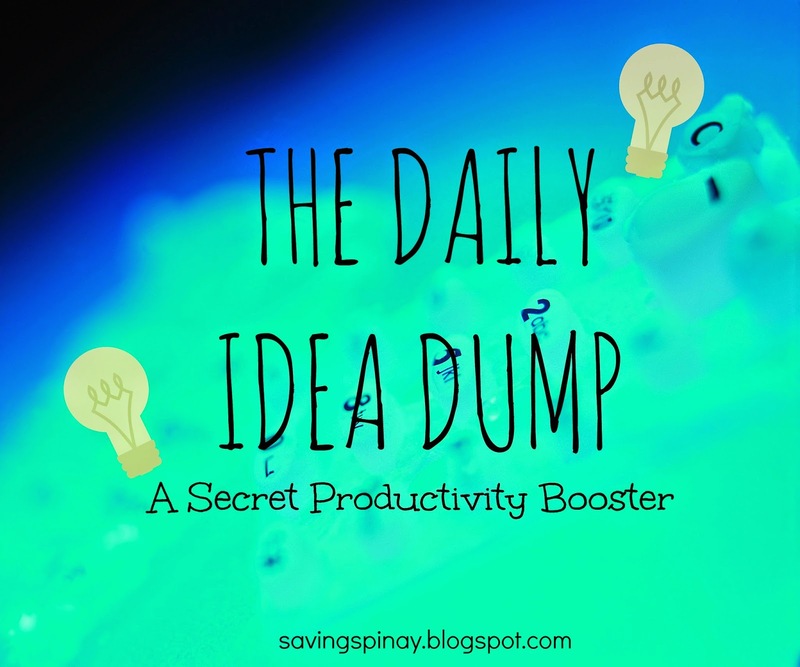 I believe in the benefits of idea dump and I firmly believe that its something that everybody should do. Dump what’s on the mind if you want to release the heavy feeling. Make sure though that you are forcing yourself too much. If there’s no idea to dump then don’t dump. Also if you have a lot of ideas then make sure that you only select a good 7-10 as To Dos of the day then schedule the others for the next days. This is important for you don’t want to experience Idea Overload. Things should flow as smooth as possible thanks to Idea Dump. 2. How I Balance Life and Work?